I’ve seen a couple of interesting articles today about the new Grand Theft Auto game, specifically related to it being played by kids. As a gamer, and a parent of a 12 year-old gamer, I have an interest. 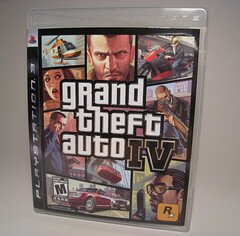 The first was a guest post by @Pols80 on A Dad Called Spen‘s blog: Is Grand Theft Auto suitable for a 9 year old?. Should it be sold to kids? Should parents buy it for their young kids? It really should be as easy as that. Shouldn’t it? Except it’s never quite so simple. Where do you draw the line? I’ve got some 15-rated games which I’m quite happy for my 12 year-old to play. They’re carefully vetted , checking reviews and, if it’s a game I already own, by my experience of playing it. It’s provoked some interesting discussions over why some games are for more mature audiences and some we feel are ok. Some mutual head-scratching on why, for instance, the new Tomb Raider game has suddenly gone from a 12 to an 18. Take Skyrim. It’s rated 15. It features a wide, open-world setting in which your character can pretty well do as he or she pleases. You can go on epic quests fighting dragons, or help the absent-minded folk of Whiterun find whatever it is they happen to have lost today. Boy, do they lose a *lot* of things. The point is, it’s clearly a fantasy game. You don’t get to wander around in real life wielding swords and firing off magic spells left right and centre. We’ve both sunk many many hours into this game, building up our characters and working through the game quests. The thing is, we talk about the game. We discuss the ins and outs, the pros and cons of why we’ve done things different ways, where we’ve both made good choices and bad, what that means for the characters and the quests. And it’s quite clear – it’s a game. And that’s the argument you’ll see around GTA. It’s just a game. Except it’s a game in which you’re expected to do some very bad, very illegal things in a very realistic, real-world environment. The line is still there, it’s still definitely a game, but for a younger audience, that line is not so clear cut. Games on screens turn into games in playgrounds. And whilst your imagination can summon up dragons and spells, how’s it going to handle the torture, violence and killing in GTA? Do you really want your kids exposed to that? Do you want your kids being normalised to that level of very realistic ultra-violence? And the argument ‘well, all their friends are playing it’ is just… what do you care what their friends are doing? Should you not be more bothered about what your kids are doing? Maybe you should be setting an example to those parents who allow their 9 year olds to play Call of Duty or GTA. Their kids who are going to be having nightmares about what they’ve seen on-screen. Do I think that violent games *cause* violent behaviour? No. But that’s a story for another day. I’d love to hear what you think. Are they just games? Should we be concerned about the age rating on games? I don’t have kids (yet) but I do think it’s important to monitor and vet what kids are exposed to. My parents certainly did. I don’t think it’s necessarily about the certificate though. I think it’s more about the kind of situation you were describing where you and your twelve year old play together and talk about the game. Every kid is different and an engaged parent will know what they’re ready for and what they’re being exposed to. definitely not all about the certificate – there are some 15 games which we don’t want him playing (though I can’t for the life of me remember which ones), but others which are fine. We’ve drawn a hard line at the 18s though. I don’t play video games (is that even the correct term? ), so your perspective is interesting. But as a non-gamer the age-rating is all-important. I would be interested to know if the parents of the 9 year olds playing GTA, COD, etc play and know the games themselves, or like me, are clueless. I’m old-school (ok, just old), so still call them video games. Computer games? Console games? I suspect the parents aren’t gamers, but really have nothing to base that on…. As a non-parent, I’m possibly not best qualified to say to what a child should or shouldn’t have access. If I think about Far Cry 3 or Dishonored, it seems to me that the age rating on them is fair and a fifteen year old (for instance) should not be playing either of them. Whilst shopkeepers should certainly be doing their bit to enforce the age rating, the buck really stops at the parents – there seem to be a lot of them who want everyone else in society to stop their kids from playing GTA V. I’m sure it’s a tough job being a parent, but there’s no reason I should have to be stuck playing Super Mario Kart so that someone else doesn’t have to say no to their kid. Your playing Skyrim and discussing it with your son seems like the ideal way forward and it’s great that you both have this in common. If more parents took an interest in their kids’ games, maybe there’d be less fear-based decision-making. I hope I want giving the impression I wanted these games banned – definitely not. I enjoy playing adult-oriented games such as CoD but am quite capable of distinguishing them as a game, something which I think certain kids might struggle with. Presenting the extreme violence and torture of GTA as a game for younger gamers is clearly not the intent of Rockstar, who market it clearly as an 18. Parents should definitely be being games like this more closely for their kids, imho. I wish more parents had the same attitude and care about the video games their sons play. I wrote about why I’m not getting GTA and why your shouldn’t get it for your sons. I definitely agree that it should be up to the parents to vet these games for their kids. Game stores are in my experience pretty good at asking for id for games aimed at older than the kids buying it. As I said to Lyndon, I don’t want to imply I want the games themselves stopped, as I enjoy some of them myself. But should kids be playing them? No. Rockstar clearly market it as an adult title. I might disagree with the content for GTA and not want to play it myself, but if an adult courses to play it that’s up to them. I definitely think the parents should be doing more research and paying more attention to what the kids are playing. My son does play some 15 rated games, but they’re all checked out online first. It’s easy enough to find out what the game is about and why it’s been given a certain rating.